This morning, a client wrote to ask my why he was no longer receiving his LinkedIn ‘messages’ via email. I have the new LinkedIn app on my phone, with the new messaging features which push notifications to my phone so I had not really realized that I too, was no longer receiving emails from LinkedIn about my messages, only receiving the notifications via the app. My guess is that when you install the new app, they may set the email default to OFF since if you leave it on, you will receive TWO notifications for each message – one via the app and a second via email. 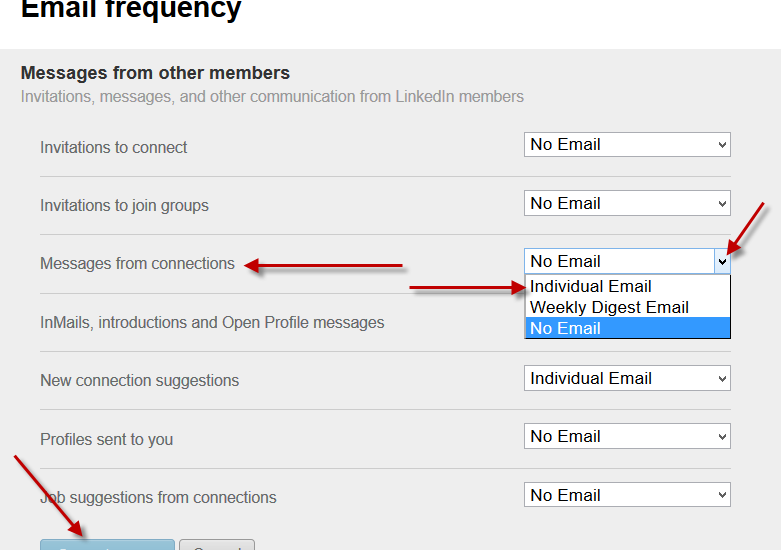 But if you do prefer to see your messages via email, here are the instructions to turn on email notifications for LinkedIn messages. Log into your account and click on the photo of yourself in the upper right hand corner which reveals a drop down menu – click ‘manage’ next to ‘Privacy and Settings’. Note that you may be prompted to re-enter your password at this point. This is a security precaution that LinkedIn takes and should not be a cause for alarm. The next menu will offer you a number of options to customize your email frequency. Here, you can control, at a very granular level, which information you do and do not wish to receive via email. 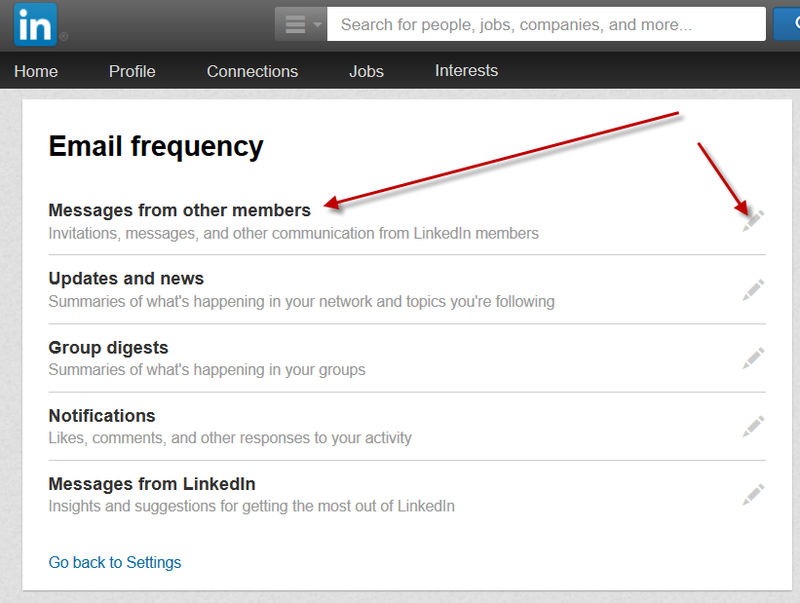 Scroll down to ‘messages from connections’ and click on that drop down and pick ‘individual email’ to receive Email Notifications for LinkedIn Messages. Click the blue ‘Save Changes’ button at the bottom of the page and you are set! This menu will also be the place to change your email notifications about invitations, etc. 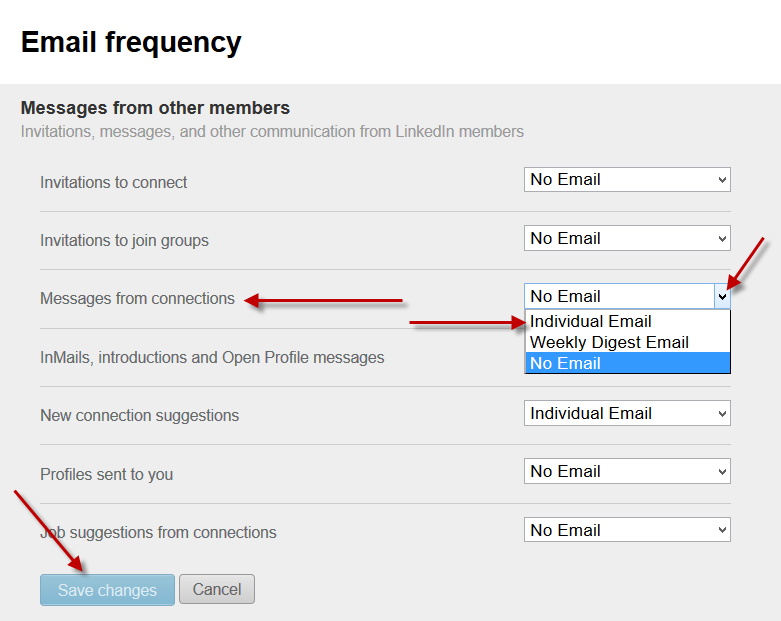 If you use your email to remind you about interactions on LinkedIn, you may want to go thru each option and re-set them accordingly!